Audi unveiled the e-tron in Richmond, California, on the home turf of rival Tesla. 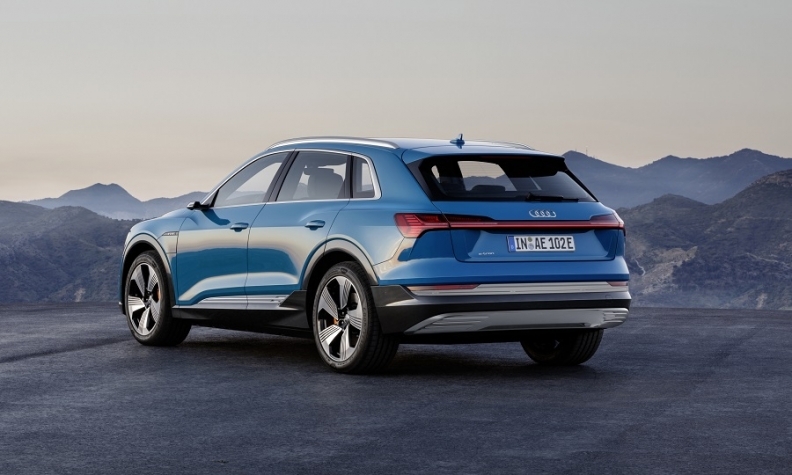 SAN FRANCISCO -- The Audi e-tron will boast a 95-kilowatt-hour battery, full-time all-wheel drive and a host of interconnected goodies to make owning the automaker's first series full-electric vehicle more enjoyable. What the five-seat premium SUV also will have, though, is the same 0-to-60 (0-97 km) time as a 2017 Audi A3 sedan (5.5 seconds) and the lowest top speed 124 mph (200 kph) of any modern Audi except the 1984 Audi Coupe (116 mph). However, like all electric vehicles, the e-tron will boast almost immediate torque, boosting its sporty feel. The e-tron's starting price is 79,900 euros in Germany, Audi said. European sales start in November. Pricing starts at $75,795 in the U.S. where it arrives in the second quarter. The e-tron is the latest in a string of dedicated EVs from European automakers that are taking aim at Tesla and other startups with Tesla-like ambitions. In Europe, the e-tron will offer an option of cameras instead of conventional mirrors to give drivers a view to the rear. That feature is still not approved by U.S. regulators. The SUV employs a pair of cooled asynchronous motors attached to single-stage transmissions to deliver torque to the e-tron's axles. When the crossover is operating at moderate speeds under a light load, power primarily comes from the rear motor and axle, and when it is coasting, both motors operate free of magnetic drag torque, increasing efficiency. The e-tron's two electric motors - one in the front and one in the rear - drive all four wheels. It recaptures energy to charge the battery as it is coasting as well as during braking, with the driver able to select the amount of energy recovery via paddles on the steering wheel. In its top recovery mode, the e-tron begins to noticeably slow as soon as the driver eases up on the accelerator pedal, allowing the driver to operate the crossover with a single pedal. Like a traditional high-end Audi quattro system, Audi's electric awd in the e-tron is able to predictively engage the front axle when the driver requests more power than the rear motor can deliver, or during wintry conditions or dynamic cornering. The e-tron also uses its electric brakes to selectively provide torque vectoring, increasing dynamic performance. The e-tron is able to automatically adjust its ride height up to 3 inches (76 mm), lowering itself at highway speeds to reduce drag. The body height also can be raised by the driver to increase clearance or to make it easier for passengers to get in and out of the vehicle. When equipped with an optional tow package, the e-tron is rated to tow as much as 4,000 pounds, Audi says, though its battery range would be limited under such a load. The e-tron's 95-kWh battery pack is thermally controlled for optimum efficiency and comprises 36 cell modules, each about the size of a shoebox. The 396-volt battery pack is roughly 90 inches long, 63.6 inches wide and 13.4 inches high, and it weighs over 1,500 pounds, including the housing pan and crash structures. The battery pack is protected, in part, by a large aluminum plate beneath the vehicle. The e-tron is capable of both AC and DC charging, including DC fast-charging of up to 150 kW at some high-speed charging stations, enabling up to 80 percent of the battery to be charged in about 30 minutes, Audi says. For home charging, the e-tron will come with a 9.6-kW capsule charger that can be plugged into either a 240-volt or 120-volt outlet. Amazon's partnership with Audi to provide home charging systems is the first time the online retailer has struck such a deal with an automaker, and signals a new front in Amazon's drive to expand its reach into consumers' homes beyond the presence of its Alexa smart speakers in living rooms and kitchens. Audi executives said home charging stations would cost about $1,000, depending on the home's electrical system. Tesla offers wall connectors for home charging at a $500 list price, and will arrange for installation, according to the company. Despite its electric drivetrain, in many other respects the e-tron is a conventional, mainstream luxury SUV. It offers seating for five, and its length and wheelbase position it in the center of the market for midsize, five-passenger luxury SUVs such as the BMW X5. The e-tron is 5 inches (13 cm) shorter than the Tesla Model X, and it has conventional doors. The Model X uses vertically opening "falcon wing" doors. Inside the e-tron's cabin, two centrally mounted control touch screens -- one 10.1 inches and the other 8.6 inches -- are used for the infotainment system and cabin controls, while the instrument cluster features a version of Audi's adaptable screen display, allowing a more integrated map with Google Earth images. Notably, the center tunnel includes a standard Audi phone box to allow for inductive cellphone charging. In Europe, the e-tron will offer an option of cameras instead of conventional mirrors to give drivers a view to the rear. Four-zone air conditioning is standard on the e-tron, with an option to upgrade to an air-quality package that includes an onboard ionizer and adjustable aromatization. The e-tron's front seats also have an optional massager. Navigation is standard on the e-tron and comes with a special route planner when paired with Audi's Connect Plus subscription service that offers suggested routes with available charging points. The navigation system considers traffic conditions as well as the battery's current charge and required charging time when calculating arrival time. An optional driver-assistance package features adaptive cruise assist, helping a driver with accelerating and braking as well as lane-keeping in heavy traffic or at highway speeds. In urban settings, the e-tron has a parking-assist feature to help with both parallel and perpendicular parking. The e-tron is built at Audi's plant in Brussels. 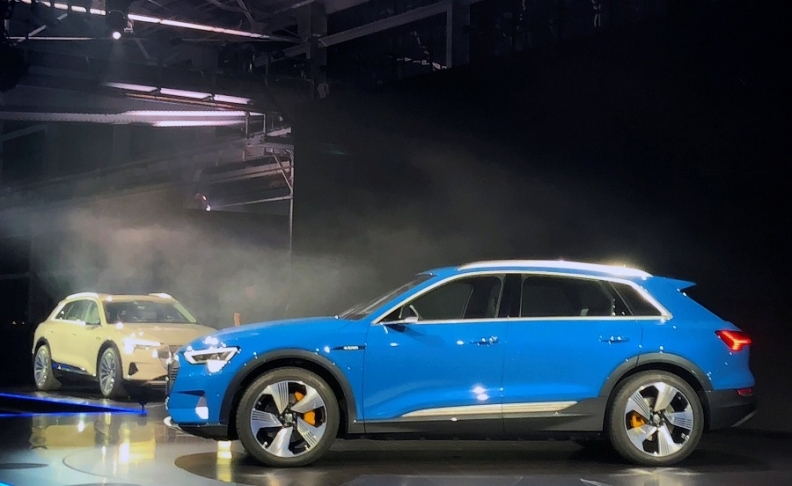 Audi unveiled the e-tron at an event in Richmond, California, on Monday. It will have a public debut at the Paris auto show next month. Audi said it plans to introduce a total of 12 full-electric vehicles in its main markets by 2025. By then, these models and Audi’s hybrids will account for about a third of global deliveries, according to a statement. A Sportback e-tron variant will arrive next year. After that, Audi will roll out battery-powered vehicles covering all major segments from compact vehicles to upscale limousines.